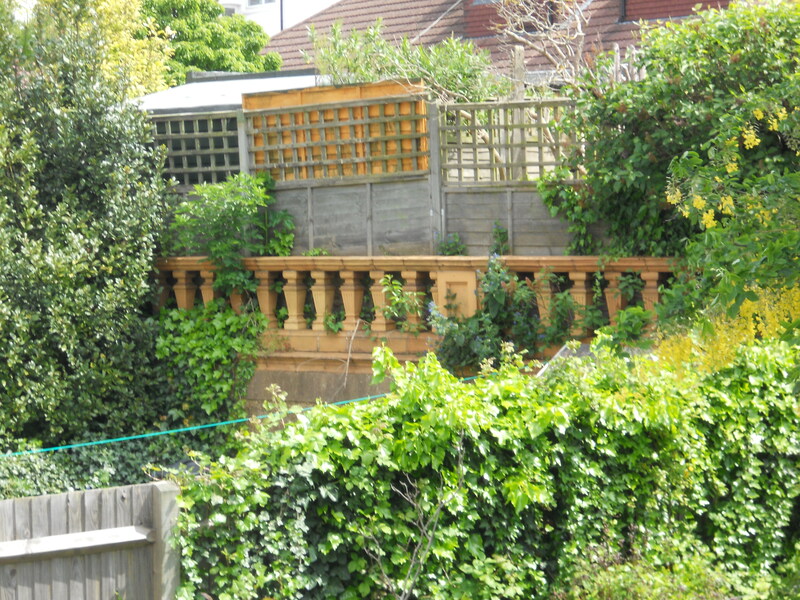 Boundary divisions between the gardens of post-war houses usually consist of nothing more than wooden fences. I was a little surprised therefore when regular reader Malcolm Pither showed me the gardens of Goldstone Lane. Goldstone Lane is the road that runs directly to the west of the old Goldstone Football Ground (now the Goldstone Retail Park) in Hove. The area was once home to Goldstone Farm that was leased by John Jackson Clark from 1877. The word ‘Goldstone’ refers to the large rock, thought to have been a Druidic altar, that is displayed in Hove Park. Clark is said to have helped to locate it in 1900, years after its burial by another farmer who was sick of sightseers. Its current location was assured when Hove Park opened in 1906. The farmhouse was built in around 1872 after the previous building was removed to make way Wilbury Road. The building, later known as Goldstone House, was a symmetrical brick-built double-fronted mansion which was characterised by generous sash windows with voussoir lintels. It was accessed from Goldstone Lane but situation on land that is now occupied by a series of low bungalows on Fonthill Road. Its elevated position afforded views across the farm and, in particular, the adjacent Goldstone Meadow. 1901 is a significant date for local football fans as it was the year that Clark leased Goldstone Meadow to Hove FC. One stipulation was that views from Goldstone House over the new ground had to be retained, which allowed him to watch matches. It wasn’t long before the newly-founded Brighton & Hove Albion called the Goldstone home as well. Goldstone House was served by a terracotta wall, similar to that which graces the Metropole Hotel in Brighton. The house was demolished in 1955 but the wall survives. 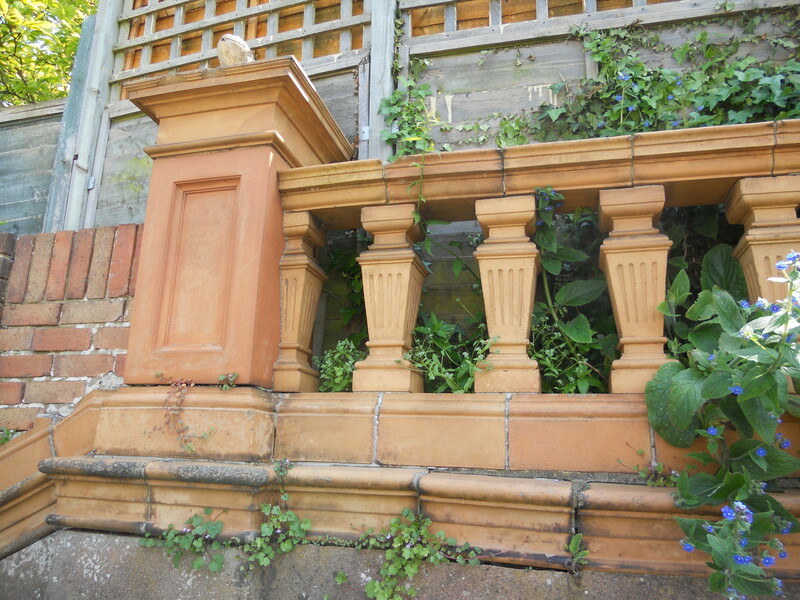 Despite the removal of its steps, other sections are in perfect condition, as can be seen from the gardens of Nos. 33 and 35 Goldstone Lane. On close inspection, the wall is perhaps finer than the Metropole’s. After all, its plinth is more pronounced, its fluted balusters more attractive, and its shade of orange more alive. Although Clark did not build Goldstone House, he may well have added the wall. As a farmer, baker, builder, councillor, magistrate, freemason and friend of the Albion, Clark was a great man. What is perhaps the only physical reminder of his time with us now gathers ivy.